If one product has made the world of difference in my classroom THIS year, it has to be my "Any Time" centers. I used to D-R-E-A-D scrounging through all of my holiday centers to round up centers that aligned with what we were currently studying (or had studied already). I would get so frustrated when I would find the perfect center but it was Halloween themed and it was now February! NO MORE! 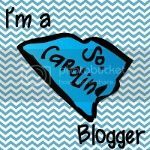 I've been steadily plugging along at the "Any Time" centers this year and I'm starting to see the light! 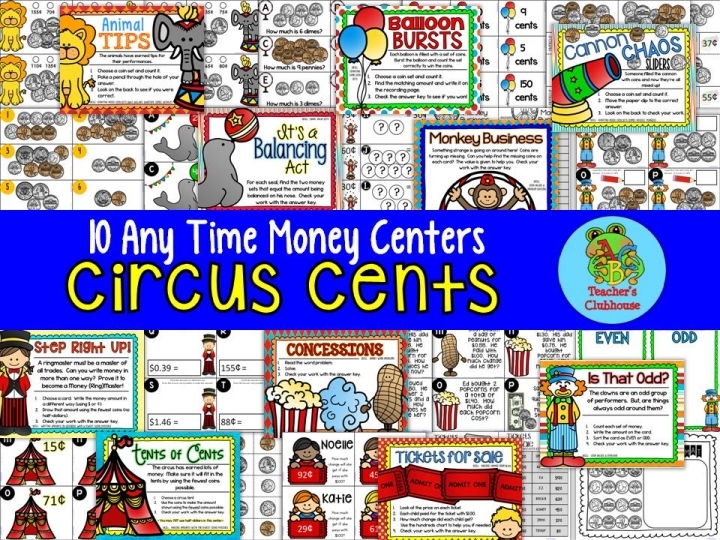 Here's a sneak peek at the newest set - "Circus Cents" - 10 money centers with a fun circus theme that can be used ANY TIME of the year! Now, with common core, money is not addressed in first grade. That means our babes are coming up with a severe lack of money knowledge. These centers address everything from counting same set coins to equivalent sets to making change to problem solving! Everything you'll need during your money unit. 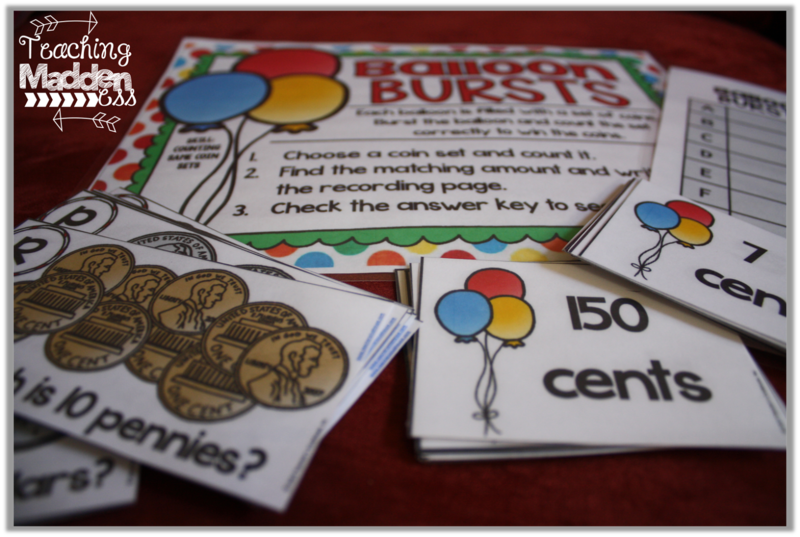 In Balloon Bursts, students count same coin sets and then match the set to the balloons that they burst from. An answer key and recording sheet are included. 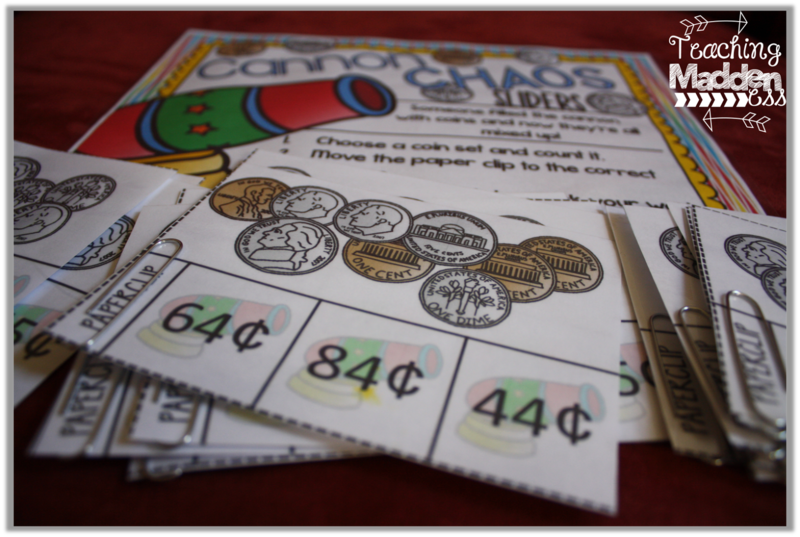 In Cannon Chaos, students will count sets of mixed coins (pennies, nickels, and dimes only) that shot out of the cannon! They will slide the paper clips to the correct answer and then check the back to see if they were correct. 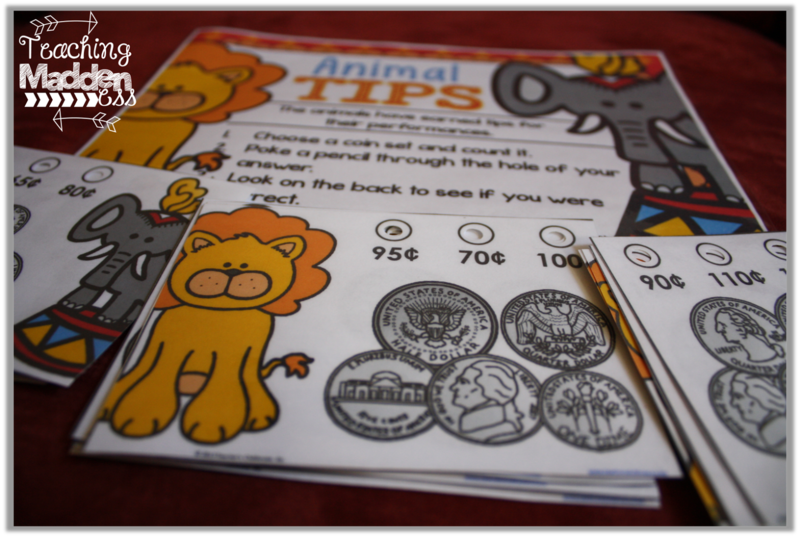 In Animal Tips, students will count sets of mixed coins (half dollars, quarters, dimes, and nickels). They will poke a pencil through the hole of their answer and check the back to see if they were correct. In Is That Odd? 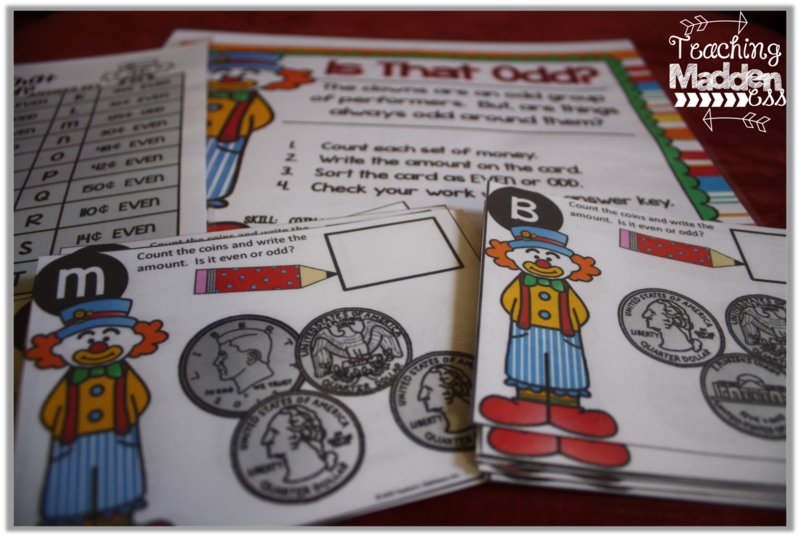 students will count the mixed set of coins and write the amount on the card. They will then decide if the amount is ever or odd and sort the cards on a sorting mat (not shown here, but included). 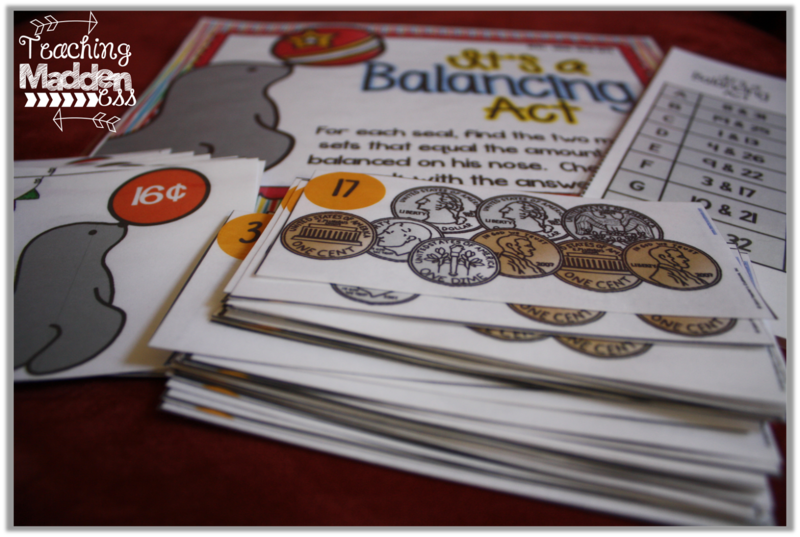 In It's A Balancing Act, students will find two sets of mixed coins that both match the amount on a seal's ball, learning that there's more than one way to make an amount! 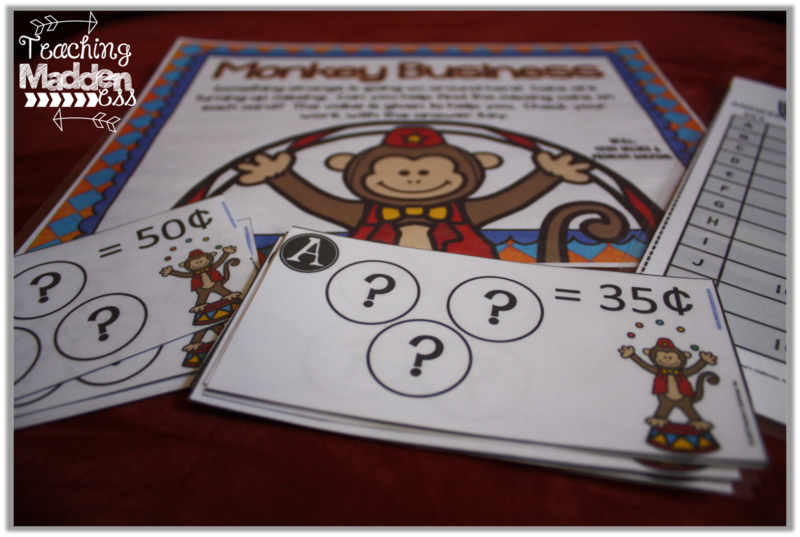 In Monkey Business, students will use their knowledge of coins and their problem solving skills to figure out what the "mystery coins" are on each card. 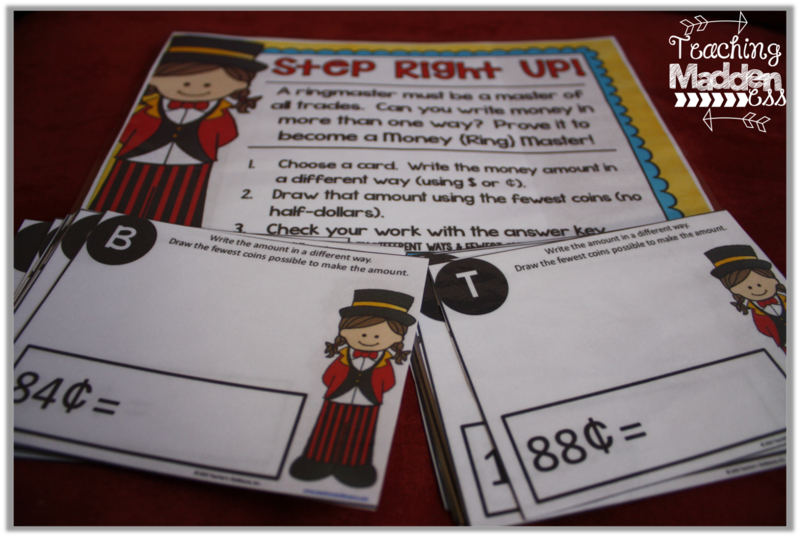 In Step Right Up, students will write the amount of money shown in a different way (using either the cent or dollar sign) and then make that amount with the FEWEST coins possible. In Tents of Cents, students will select a tent and then use the coins included to make that amount using the fewest coins possible. 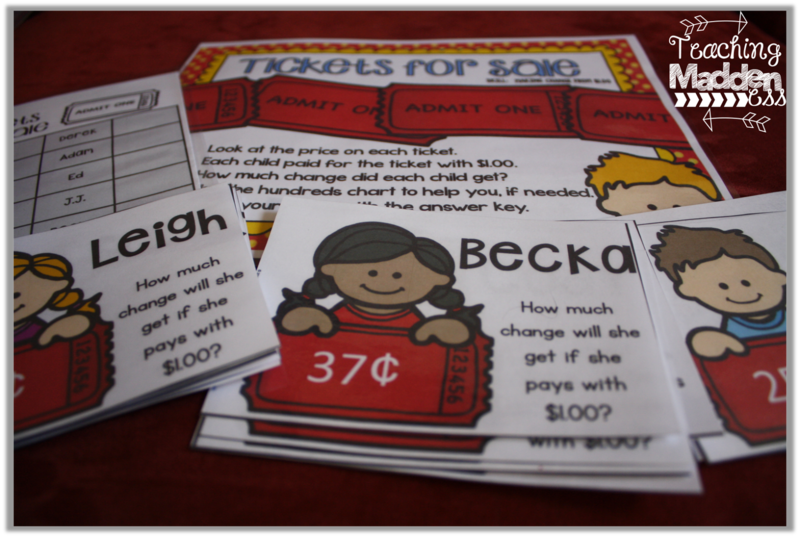 In Tickets for Sale, students will help a crew of children make change from $1.00 using their ticket prices. A hundreds chart is included as a resource to use, also. 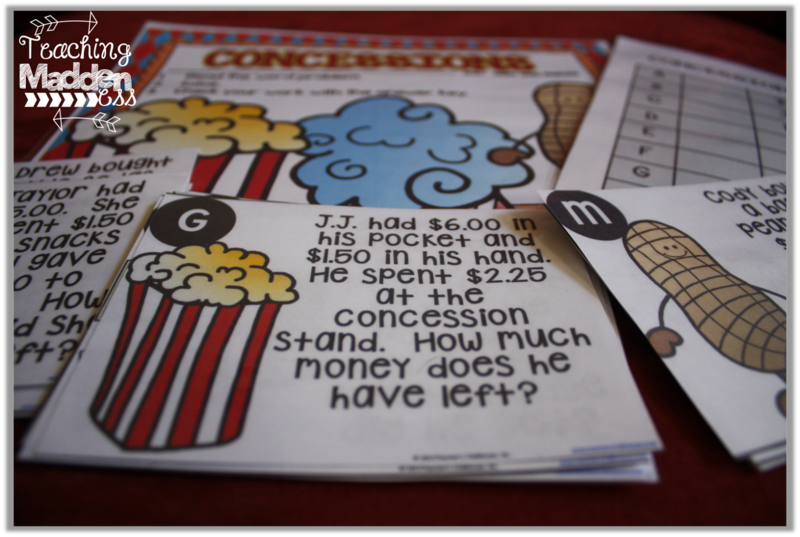 In Concessions, students help a crew of children solve money-related story problems while they're at the circus. A problem solving workmat is included to assist students. So, there you have it! 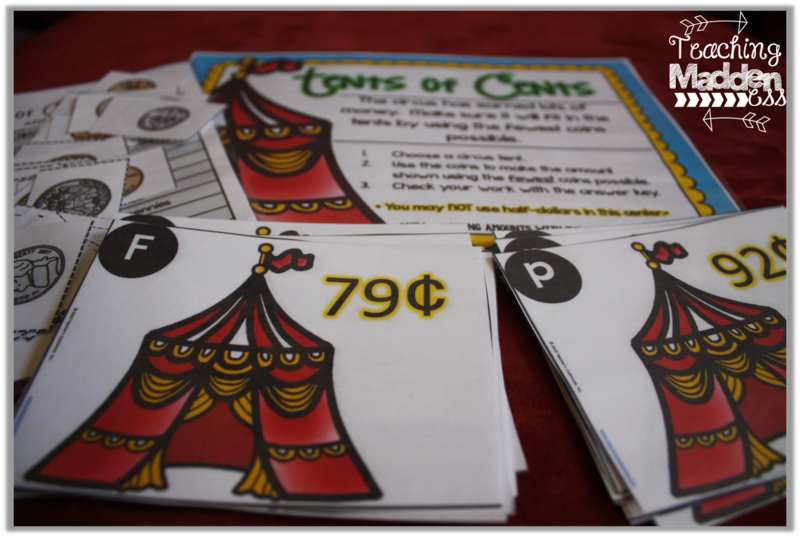 Circus Cents - 10 centers to provide students with the practice and reinforcement of all the skills they'll use during your money unit. What I love most about these centers is that they're so versatile - you can use them as centers, early finishers activities, or roam the rooms. And, there's 10 of them....perfect for pairing your kids and having everyone practicing their money skills at the same time while you work with small groups. #centerlove You can pick them up now at our Teacher's Clubhouse on TpT shop for just $4.99! Wow, what a great concept to create this amazing unit that can be used whenever!!! 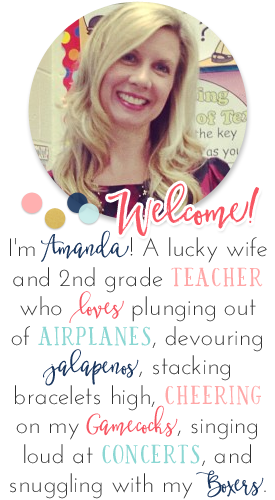 I am always amazed at the creativity that teachers have.